Clothing/Jewelry Description An Imperial Security guard uniform. Medical Conditions McGhee suffers from mental illness and does not have her medication with her. Distinguishing Characteristics African-American female. Black hair, brown eyes. McGhee's ears are pierced. Her nickname is Marla. McGhee was last seen in the 3900 block of Ridgedale Street in Memphis, Tennessee on May 12, 2015. She dropped her sons off her father's house and said she was going to stay for dinner, but then she changed her mind and decided to go home. That night, McGhee's parents got a call from her children's father. He said McGhee had hit him in the face after an argument. He called the police, but by the time they arrived she was gone. When her mother tried to call her, McGhee didn't answer the phone. She has never been heard from again. It's uncharacteristic of her to leave without warning. 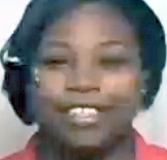 Since her disappearance she hasn't used her EBT (electronics benefit transfer) card. Her car, a tan/brown 1999 Ford Contour with tape on the driver's side window and the Tennessee license plate number 302ZTG, has not been located. Her case remains unsolved. Updated 2 times since October 12, 2004. Last updated March 31, 2019; details of disappearance updated.